Who inspires you in our community? Who is a creative and courageous leader? What individual or congregation/organization has made a significant impact in the areas of racial justice and reconciliation, affordable housing and confronting homelessness, immigrant justice and accompaniment, and/or promoting economic justice? The Church Council is accepting nominations for the 2017 Rev. Gertrude Apel Pioneering Spirit Award. We encourage you to nominate an individual and/or a congregation/organization. The awardees will be honored at the Weaving Our Strengths Conference on Saturday, September 30, at University Congregational Church, Seattle. Below is a list of former recipients. 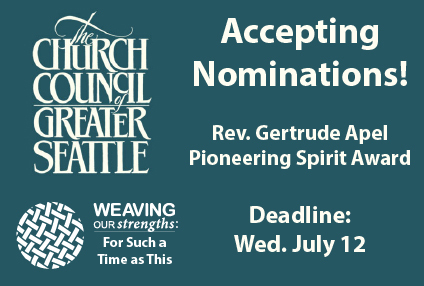 Please email the completed nomination form to aerickson@thechurchcouncil.org or mail to PO Box 18467, Seattle WA 98118, by Wednesday, July 12, 2017. The Church Council created the Rev. Gertrude Apel Pioneering Spirit award to honor and remember her and to recognize an individual and a congregation/organization who embodies Rev. Apel’s spirit and lives out their faith in the social justice/community service area. In 1930, during a period of major economic depression, the Rev. Gertrude Apel was the first General Secretary of what would become the Church Council of Greater Seattle. In a time when women did not “lead” organizations, Rev. Apel was a tireless ecumenical leader and an amazing organizer. She had a talent for fostering cooperation and always getting things done.